Dr. Adams is a Staff Physician at the Ann Arbor VA and Clinical Lecturer in the Division of Gastroenterology at the University of Michigan Medical School. After graduating from Carleton College, Dr. Adams pursued a law degree and subsequently served as an appellate law clerk to two judges on Maryland’s Courts of Appeal. She thereafter matriculated to medical school at the University of Maryland, and completed both her internal medicine residency and gastroenterology fellowship at the University of Michigan. During her fellowship, she earned a Masters of Health and Healthcare Research through the University of Michigan’s Rackham Graduate School, with the goal of developing a career in policy-relevant health services research informing the financing, organization and delivery of gastrointestinal care. 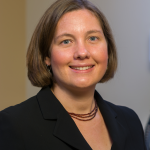 Her primary area of research focuses on endoscopic resource utilization, and improving our understanding of the drivers of inappropriate use of endoscopic resources in gastroenterology in order to devise mechanisms to deliver higher-value care. Her current research focuses on examining trends and variation in utilization of monitored anesthesia care for gastrointestinal endoscopy in the Veterans Health Administration, with the ultimate goal of developing appropriateness criteria to encourage value-based utilization of anesthesia services in this setting. She also has an interest in medico-legal issues in gastroenterology, and has undertaken novel research in this area. She is a member of the Quality Measures Committee of the American Gastroenterological Association (AGA), and represents the AGA at the AMA-convened Physician Consortium for Performance Improvement. She also serves on the Health and Public Policy Committee of the American Society for Gastrointestinal Endoscopy.